I'm not sure if you could tell, but I was pretty chuffed to receive my business cards in the mail, and like I mentioned on Instagram, I said I would post about my experience with Stitch Press. 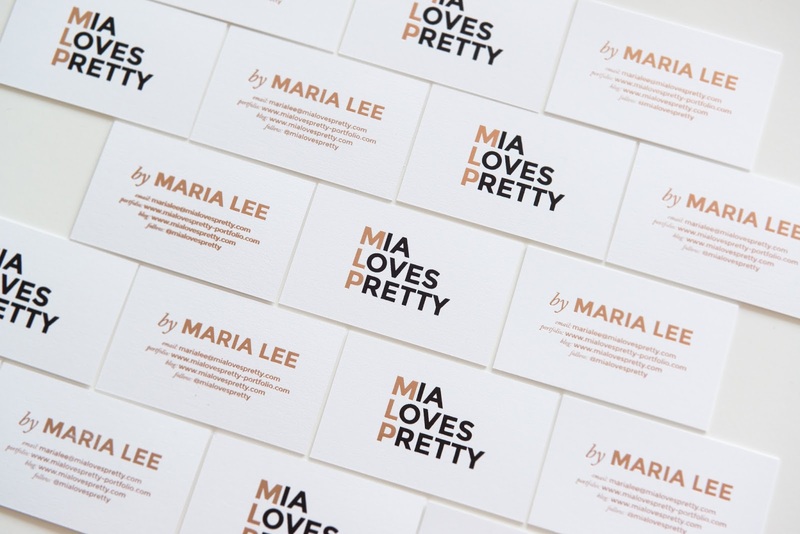 I never thought to get business cards printed until after one too many conversations that ended with "oh you do Makeup? could I get your number?" or "oh you have a blog? What's the website address? I'd love to have a look" ... and the answer would always, "oh let me write it down on a piece of paper for you", or "oh I'll type it on your phone". Not only did this always seem a tad unprofessional, but it always felt inefficient. 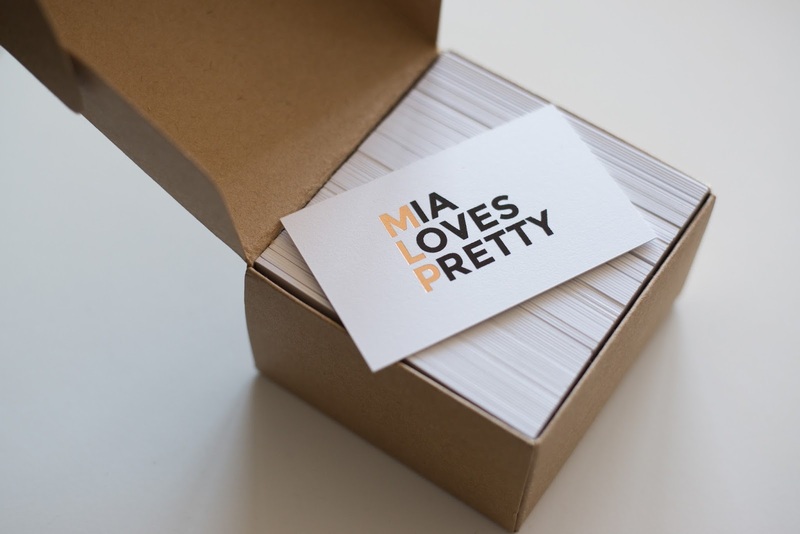 I realised I really didn't have anything tangible to pass onto someone that was simply a quick snapshot representation of Mia Loves Pretty. After thumbing through my Instagram feed as I normally do on a daily basis, I came across Stitch Press and was wowed by the sight of beautifully pressed metallic gold foil on paper. Now I can't remember exactly how I found Stitch Press, I have a feeling I had one of those days where I wanted to see the "explore" page and spotted the little gem, but boy, I'm so glad I did. So after a long time umm-ing about whether to do a business card or not, the sheer prettiness of the Stitch Press portfolio got me impressed and motivated me to just get some designed and printed. To my delight, Stitch Press were having a bit of a sale (and they still are!) which hurried along my actions, so I decided to get in touch with San from Stitch Press for some samples for further confirmation that what I saw on Instagram was indeed the real deal, and after a speedy email reply, I ordered and received about 10 business card samples in the mail. As you know, I am a one-woman-band (with the occasional help of Jase; the groupie - haha), and with this one-woman-band there is a graphic design rookie with a lot of questions about the graphic design world. I knew my way around Photoshop relatively ok, and knew that I wanted to get myself a simple design with a rose gold foil option...but did not know what on earth a .ai vector file was nor how much "bleed" to design with the card. Perplexed, I got in touch with Stitch Press with what it seems like 593483948 emails just so I knew exactly what format and instructions they needed from me. Email replies from Wynne, their customer rep, were always within the 1-2 days and questions were promptly and patiently answered with advice. After a few days fiddling around with Adobe Illustrator and sending my design off to Stitch Press, I got a proof and confirmation invoice back within 2 days. And then once paid, I received my business cards within 17 days (the original quoted turnaround time was 3 weeks). 600gsm seems absurdly thick for a business card doesn't it? 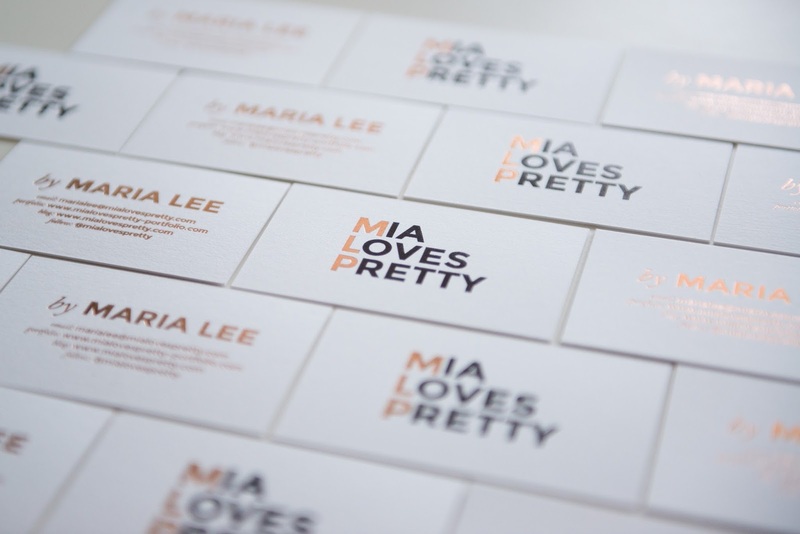 Regular business cards are normally 350gsm - 400gsm thick. I only realised this when I could only fit 5 business cards in my Kikki.K cardholder. BUT, the 600gsm option was offered to me as a free upgrade, since my first option for either a 500gsm or 560gsm card was out of stock. I don't mind the thickness, in fact I feel it sets my card a little apart from the others because of how much sturdier and sharper it feels to a regular business card. One teeny gripe I had when I cast my perfectionist eye over the stack was that there were 2 cards that came printed a little subpar; one card looked like it had been double printed so the text was a bit too bold, while another card's foil was a little faded. BUT... I tallied up the cards I received and San had actually printed 5 extra cards to no doubt cover any potential errors. Nice touch Stitch Press! I'm a keen supporter of local talent and small enterprises so this is a definite win win situation for me! While it'll probably be a little while before I need to reprint anymore business cards, I can tell I will be a repeat customer just from this small experience.